Internet Explorer 8 Beta 1 Released - Your Thoughts ? Microsoft released the first public beta of their upcoming flagship browser Internet Explorer 8 to the public and I would like to use this article - and the comments - to get some opinions about it. I know that a lot of you must have installed the new browser by now and surely must have something to say about this first version. Internet Explorer 8 Beta 1 is available for Windows Vista, Windows XP, Windows Server 2003 and 2008 both in 32-bit and 64-bit editions. The Internet Explorer 8 Readiness Toolkit homepage lists several of the new features of the new browser, amongst them an improved phishing filter, automatic crash recovery and two features called Activities and Web Slices that require some further explanation. Activities are context related services that can be accessed by right-clicking on the website. They offer basically the same features that multiple Firefox add-ons offer, like looking up a definition of a term, digging a url or translating a sentence. 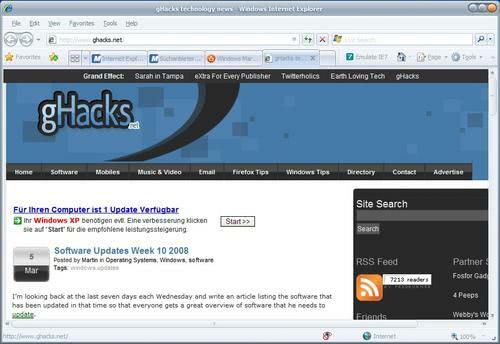 Web Slices are little applications that behave like feeds and can be added to a Internet Explorer 8 toolbar. You could for instance display the weather conditions of your hometown there. Internet Explorer has some exciting new features build in during first start. It is now possible to import bookmarks from Firefox and or Opera and a scan is performed to check which Firefox add-ons are installed with the option to visit the Windows Marketplace to find similar extensions for Internet Explorer. That search however has to be improved because my results list had more than 9000 entries lots of them unrelated to the add-ons that I had installed. I think that many users will welcome those new usability functions in Internet Explorer. Web Slices could be interesting in some occasions, not only for weather conditions but also for stock market information or even the daily meal in the cantina. Oh, and Ghacks is rendering fine. The Download Squad did not have that much luck. no problems so far. fairly fast. not much of a new interface. Runs quite well. will post more after more use. Excuse me? I came looking for how to get a weather webslice, and you tell me to get firefox? I have linux, and because other computers have IE6, I use fire fox for everything except windows. Anyway, anybody know how to get a weather webslice? My sites rendered fine. I guess as long as your coding with valid standards it is not a problem. Also, the Emulate IE7 allows to browse the web just as if you were using IE7. The loading time is faster. I did notice a few crashes, but I guess that is because it is still in beta.